Nick was born in Chesterfield, Derbyshire (of ‘crooked spire’ fame) in 1959. Despite attaining an ‘A’ in art at A Level he was encouraged to go to University rather than Art School .He read Archaeology at Leicester University followed by a P.G.C.E. In the early eighties Nick moved to the beautiful village of Great Bowden in the heart of the Leicestershire countryside. Living in the country and fuelled by frequent visits to Cornwall, Scotland and the Lake District he became much more interested in Landscape painting. This led to years of experimentation with different media which is when he discovered the vibrancy of acrylic inks, using them like watercolour paints. This was the beginning of a new enterprise Altered Images a small company that sold Nicks prints and cards to galleries across Derbyshire (having moved back there in1988). In 2003 Nick and his wife became partners in another venture, Charisma Gallery in Matlock. The gallery showcased Nicks works along with other artists and craftspeople from all around the UK. Owning an art gallery had always been a dream of Nicks and the experience gave him the encouragement he needed to take his art to the next level, professionally publishing his work and exhibiting in galleries throughout Britain. Nick is now represented by Buckingham Fine Arts. 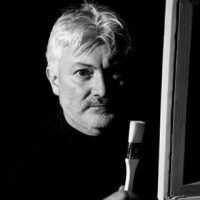 His work can be found in many galleries throughout Britain as well as several local galleries in Northumberland which regularly stock his work. He has work in collections in Europe and has several ‘celebrity’ collectors. Nick paints in his garden studio to the background of Audio books . These are often unabridged and can last up to 17 hours. He is so attuned to this way of working that he cannot paint without them. They are as much a part of the painting process as the paint or canvas.